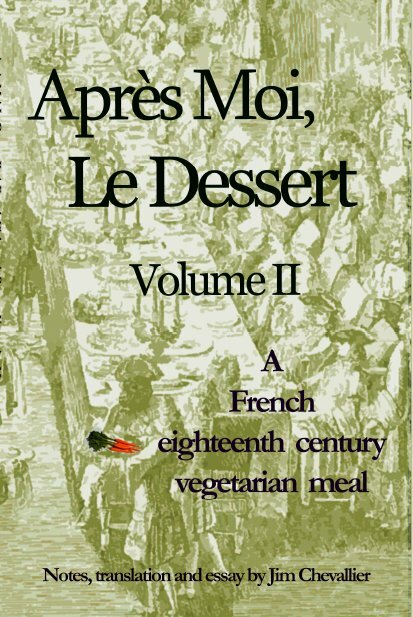 More original eighteenth century recipes, most newly translated from French, selected once again to match (where possible) a menu from the time - in this case, one for a vegetarian meal ("A Meal of Roots") served to the otherwise decadent Phillippe D'Orleans, later to be the Regent of France. Over 100 recipes for soups, stews, salads, sweets, even... mock fish (made from vegetable paste). The ingredients include not only root vegetables (carrots, parsnips, beets, turnips, sunchokes, etc.) but leafy vegetables such as sorrel, spinach, purslane, chicory and chard, and various legumes such as beans, lentils. And peas. 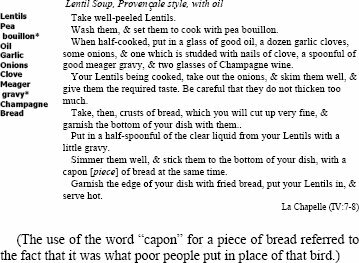 Lots and lots of peas — the French loved peas —, and onions. Six Soups, two small, & four medium. A Soup of small Onions, a Bread in the middle. A soup of Lentils in oil, garnished with fried bread. One of Asparagus in green purée. One of Soup without butter. & garden herbs in oil. One of other different Roots, Four dishes of Oysters. 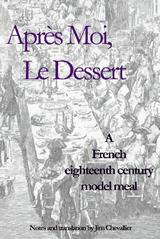 Were there vegetarians in eighteenth century France? In attempting to answer that question, the first thing to point out is that, though vegetarians have existed since classical times, the word itself arose in the nineteenth century (in England). Still, the concept of a vegetarian diet was known in France at this time, and was called (by Rousseau among others) a “Pythagorean diet” (Pythagoras having been one of the earliest recorded vegetarians). The most meaningful answer is “Too few to speak of”. Yes, the greater part of the population mainly ate vegetables, but not by choice. Others did so under some measure of constraint, be it medical or religious. This leaves the extremely rare cases of individuals who adopted eccentric diets, often without meat, but also without vegetables, and whose reasons for doing so typically remain obscure. All translations copyright 2009 Jim Chevallier.